It pays to be nice. I believe that, though, at times, like most everyone, I could do better. And, people who are just rude - I don't have the patience for them. But last night I finished reading the Steve Jobs biography. No doubt how it was going to turn out, but it was interesting how I responded to reading about someone who was so notoriously ruthless in his dealing with people, and how I found myself appreciating him for that giant personality flaw! He wasn't like Hitler, literally killing people for his personal goals and beliefs, and God knows what the world would be like if we had millions of Steve Jobs running around insulting people, telling them their ideas are crap. And it didn't just extend to computers. At one point, after his liver transplant, someone came into his hospital room and slipped a mask over his face before doing a procedure. They thought he was unconscious, but he ripped the mask off and said it was ugly and he refused to wear it. He made them bring 5 others in so he could select the best designed one to wear. I've been using Apple products since purchasing my first computer in 1984. I have to admit that when my mom was talked into getting a PC "because it was cheaper" - the thing was nothing but a headache. Steve wanted his systems to work in perfect harmony - and for the most part they do. I just shake my head at friends who have PC's which are constantly in the shop with a virus, or something just not working…… "And HOW is that PC saving you money?" I want to ask? I can hear Jobs - "They are building crap!" Jobs set a high standard and those who rose to his calling - while they complained about his rudeness - they were also proud that he got them to do more than they would have without his pushing. I've often said our country needs a time of cleansing. We've become a country of whiners and it bothers me that the ethics have gone out of our day-to-day thinking. Too bad they can't just turn the country over to someone like Steve Jobs. Someone who would cut out the crap and focus on the programs and goals that are efficient and well designed. Instead we have a mishmash. As Steve would say "we have crap". With winter upon us, its a good time to settle down with a good book. 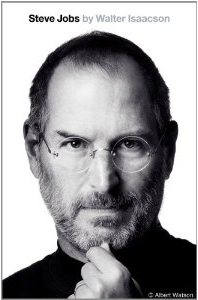 "Steve Jobs" is a fascinating and personal look at a genius who has changed our world.